When the first wave of protests erupted in Ferguson, Missouri, following the shooting of Michael Brown in August 2014, it looked as if unrest might spread to other American cities, echoing the “long hot summers” of 50 years before. Throughout the 1960s, a seasonal pattern of racial riots developed across urban America, leading observers to hypothesize about an association between summer heat and urban unrest. The Kerner Commission, tasked by President Lyndon Johnson with investigating the causes of the more than 150 riots that broke out in 1967, lay the blame on a toxic combination of poverty and racial politics. However, the Commission also noted that anger in urban America was being stoked by the uncomfortable heat of summer. Is our growing globe of cities and rapidly changing climate a ticking time bomb of social unrest? One might be tempted to leave the latter argument in the past, a remnant of long since dismissed environmental determinism and a particularly ugly period in America’s racial history. However, rising mercury levels are well known to lead to a myriad of undesirable behaviors, ranging from sporting event violence to petty crime, and recent climate change research suggests that many more of us are now or will soon experience warmer weather, either as a level increase or in conjunction with more frequent weather extremes. So the question must be asked, is our growing globe of cities and rapidly changing climate a ticking time bomb of social unrest? Are we all at risk of becoming hotheads? In a recent article in the Journal of Peace Research, I attempted to answer this question by examining the relationship between temperature and the occurrence of urban unrest in Asia and Africa. Although widespread violence was fortunately avoided after Ferguson, my analysis supports, with some qualifications, previous research indicating that urban unrest increases during hot weather. It is not heat that triggers these incidences. There are economic, political, and cultural conflicts that bring people into the streets. The Arab Spring, communal riots in India and Nigeria, and communist revolutions of the mid-20th century attest to the many motivations of participants. But the available data shows there is a relationship: urban unrest in Asian and African cities is most common and occurs with greater frequency and more violence during relatively warmer months. Readers of this blog who live in large cities in the Global North may be familiar with the idea that crime, particularly violent crime, increases once winter breaks and the warm temperatures of spring and summer take hold. Criminologists and psychologists have studied this phenomenon in some detail. There are measurable differences in aggressive behavior between time periods for the same city and cities in different climates. One explanation for these findings is that temperature has a direct and negative effect on comfort, emotions, and ultimately the decision-making of individuals. This proposition has been tested and confirmed in many settings, though mostly the United States. The broader claim also has lineage in political science going back to Montesquieu’s The Spirit of the Laws. What is less certain is whether temperature has a similar effect on group social behavior and whether it matters for how contemporary politics plays out in avenues across our global network of cities. Urban social unrest is a complex phenomenon, driven largely by a mix of socio-economic discontent, inequitable systems of social control, and dense social networks that allow urban dwellers to mobilize more quickly and efficiently than rural inhabitants with similar grievances. In developing Asia and Africa, these factors are complemented by fairly new patterns of rural-to-urban migration, contentious histories of urban-rural politics, and the increasing stresses of globalization. However, urban unrest is not modern, nor is it caused by modernization. Popular protest and the mobilization of the urban crowd are as old as cities themselves. First, warmer cities experience more unrest than cooler cities. This, however, says more about the persistence of conflict in Africa and parts of the Asian tropics than it does about the direct effects of weather. Second, evidence shows that urban social disturbances commonly occur in months with higher average temperatures, but this relationship is neither strong, nor ubiquitous. Third, and most importantly, temperature has its greatest effect on the occurrence of violence. During warmer months, the likelihood that urban disorder has lethal consequences is several times greater than the likelihood that it is peaceful. This finding is fully consistent with our knowledge of the relationship between temperature and crime, and suggests that warm weather exacerbates interactions between combatants, but does not act as lone trigger for urban social unrest. What does this mean in the context of climate change? Global warming alone is unlikely to have a large impact on incidents of urban unrest. Humans acclimate, they adjust to their environment, and given technological advances, the behavioral impacts of higher temperatures are unlikely to be that of widespread disorder. But climate change is not just about warming. Extreme weather, rising sea levels, demographic shifts, and agricultural transformations are all part and parcel of major climate transformations. They too stress urban social, economic, and political systems. Cities are naturally primed for social conflict, and heat can lead to more frequent and more violent confrontations. However, it is paramount that we think holistically about how climate change works to threaten the social stability of cities. Adam Yeeles provides research and consulting services on issues of global socio-environmental and political risk. He has been a lecturer at the University of Texas at Dallas and worked in public affairs and nonprofit management. Sources: Journal of Peace Research, Montesquieu, Nature Climate Change, The Nature Conservancy, Psychological Bulletin, U.S. Department of Justice. 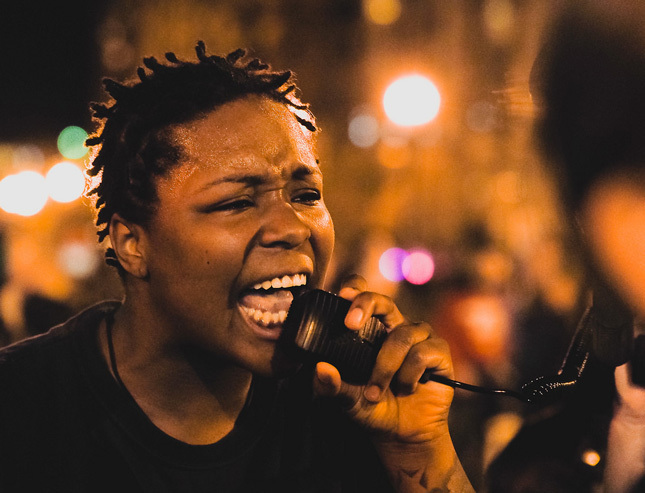 Photo Credit: Scenes from a Ferguson protest in Washington, DC, courtesy of flickr user Joe Newman.